This morning I went on a walk and found 3 fresh scats from last night. Two were from gray foxes and one was from a striped skunk, and all three were choc full of raspberry seeds. I myself had eaten my first raspberry of the spring three days before. On my walk this morning, I found five ripe raspberries. My guess is that the foxes and skunks were able to find many more because they are less picky about ripeness and are more willing to brave the poison oak to find them. What this brought to mind is how animals rely on seasonal sources of food. 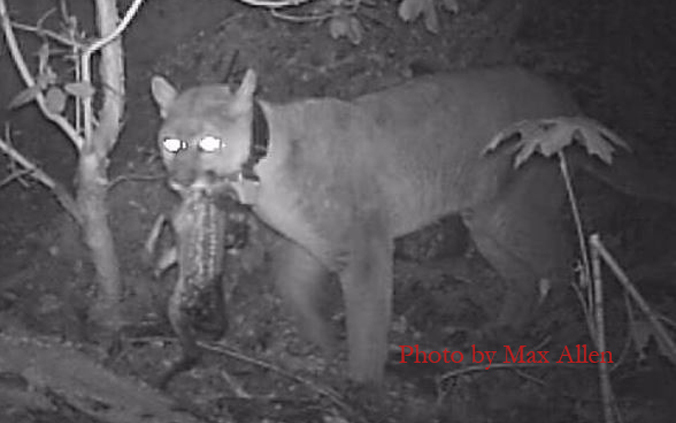 Right now, pumas are eating a good number of black-tailed deer fawns. For example, the last 4 of 36M‘s feeding sites that we have investigated have all been fawns. Fawns are an abundant food source this time of year for pumas, and they are likely easier to catch than adult deer. This could be a particularly useful resource for dispersing juveniles, out hunting on their own for the first time, or for females with dependent kittens to feed.